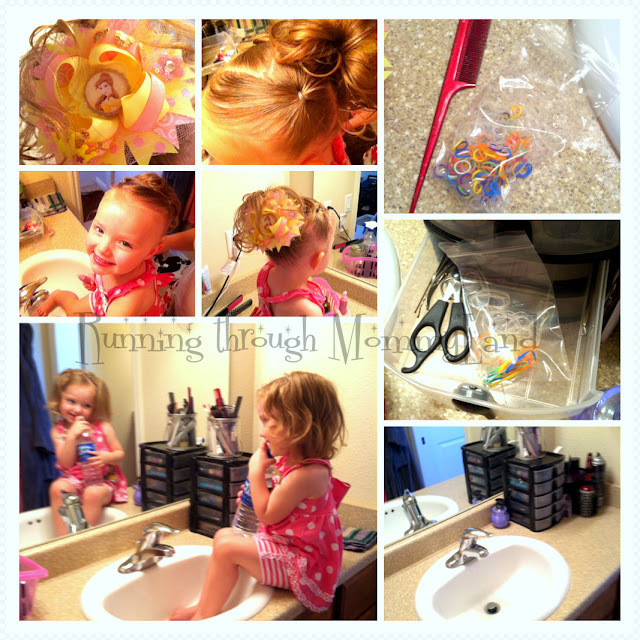 Do you have a hair station in your home? I am always asked how I get Shelby to sit for me to do her hair. I figured I would do a post about it and hopefully it helps other mamas. Up until this last weekend our bathroom (mine and Shelby's) is usually a mess. Well the counter is at least. With 2 girls we have a lot of products. Since she is only 2 I am sure it is bound to get worse so I needed to get it under control. I cleaned everything top to bottom and then went to work organizing. Shelby has such fine hair it takes a lot of pony holders to tame it. We have tried them all and have found that Goody Plastic hair bands are the ones for us. They do stretch out and are hard to get out of her hair without pulling so we just cut them out. I do not her. They are cheap enough for us to just replace them. They come in a package of 3 sizes. So I got some little ziploc bags that I had for my craft beads and seperated out the sizes. I created one corner of the counter that is just for hair and make up. I have her sit on the counter and we do her hair. The key to getting their hair complete is you need to occupy their time. So I let her bring toys, books, or whatever. She usually just plays with my makeup. We have been using our new hair station a few days and I have noticed a few things. The counter has stayed mess free. Having the pony holders in bags it is easier to reach for them and get them out without letting go of her hair. Getting her hair done everyday is a must. I can't handle her with messy hair. Unless of course she has spent a few days with dad. He doesn't do bows and all the fancy hair. It is ok he makes up for it. So get set up and create a hair station. They will love it. You will too. Love the organization! It looks great...awesome idea to keep everything together and in one place!